Digilent is a world class designer of FPGA and system boards featuring Xilinx technologies. 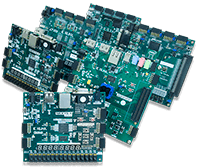 Through our partnership with Xilinx and the Xilinx University Program, our trainer boards, which can be found in over 3000 universities, research labs, and industrial settings worldwide, combine maximum performance with maximum value. So what is it that sets our system boards apart? 1. We design our boards with built-in programming circuits, so our customers can get started with no additional expenses. 2. We carefully choose each board's supporting technologies, such as generous external memories and industry-standard peripherals and connectors, not only because they're cutting edge but because they do the best job of emphasizing the capabilities of each board's FPGA. 3. We make it easy to get comfortable with our boards by minimizing the number of complicated settings and configurations. Examples of this include easy-to-read jumpers for selecting board power mode and boot-mode (for booting from USB stick, JTAG, or on-board QSPI). 4. We focus on the long-term usability of the board through clear silk-screening, numerous demo projects, online resources and community technical support.